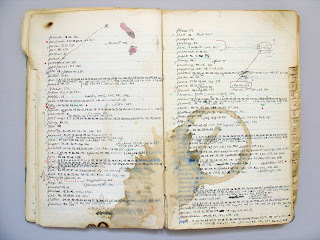 Although in the first ten years or so of work on A Humument I relied merely on stumbling across names and particularities I eventually got Andy to make, in a little index book, a handwritten concordance; monkish work in those pre-computer days. It has stood the test of constant use though physically it is now even more battered and ageweary than its user. But suddenly as an extremely welcome 70th birthday present I have a finely bound, smartly printed, book version thanks to the kind thoughts and diligence of John Pull and the indefatigable Patrick Wildgust. Thus I've been able when thinking of commemoration, celebration or topical reference to look up a key word like 'seventy'. However I still rely mainly on serendipity, having chanced on 'ted heath' ("who is Ted Heath, mummy?") and 'bush' in my aleatoric trawl. It has offered me no 'blair' of course and (not for that reason alone) I'm glad to see the back of him. Welcome twelve-times-cited Brown! Ah, but which Ted Heath, I wonder? I was going to say "the one with the orchestra? ", but that doesn't help. [Blas]ted heath? I think you should anticipate dismissal from the Aleatorists' Guild, however, should their next Congress at Random ever actually occur (the invites are currently being typed by a team of monkeys), for revealing that you use a concordance... What an awesome document, though! One of the best things you can read regarding the number 70 is probably in the Bible - psalm # 70. From one to 154 (I think?) King David will offer you some of the best number related texts in history!